James Robilotta’s unique speaking style motivates students by combining a heavy dose of real talk about student leadership with his hilarious, comedic presence. ▪Will They Make Fun of My Sheets? Having worked in higher education for 10 years, James can say he truly loves the crucial moment of growth when college students figure out why they are who they are, and he’s hitting campuses across the country to help them do just that through his leadership keynotes. One thing students notice right away about James is his charismatic nature…and that’s when he’s got them! James’ background in improv comedy helps him riff with young people, making them feel more comfortable and building a rapport that comes quick and easy. Because his keynotes are thought-provoking, filled with self-awareness and laced with comedy that a college student can appreciate, James’ audiences stay engaged from beginning to end. 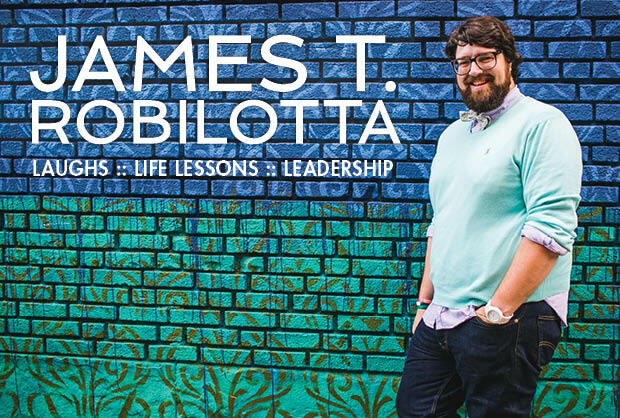 James Robilotta is an author, professional speaker, personal coach, and entrepreneur. 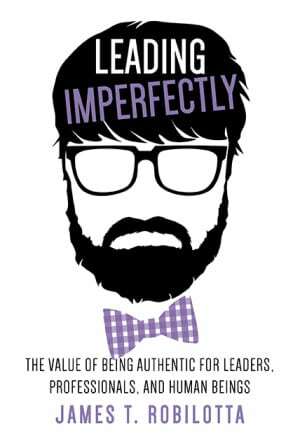 His first book, Leading Imperfectly: The value of being authentic for leaders, professionals, and human beings, came out in the summer of 2015. He speaks internationally to audiences about authentic leadership and promoting memorability. As a speaker, he is doing the two things he loves the most: causing audiences to think critically about their leadership journeys and making people laugh! His thought-proving talks are infused with self-awareness and comedy stemming from his background as a trained stand-up and improv comedian. Originally from Sayville, New York, James attended the University of North Carolina, Wilmington as an undergrad. He then pursued his masters in counseling in higher ed, earning his degree in 2007 from Clemson University. James worked on college campuses for over 10 years, developing student leaders and higher education professionals before going full-time with his speaking and coaching career. James now lives in New York and when not traveling performs with his hip-hop comedy improv team, North Coast. To learn more about James, his book, and read his leadership blog please visit his website at JamesTRobo.com or follow him on Twitter @JamesTRobo. James’ keynote drives past all that and pushes students to bring their strengths and struggles to their leadership style. His speaking style is highly interactive and inclusive, and James is not afraid to challenge students—while keeping them laughing and engaged throughout. If you’re looking for an introspective talk to bring perspective to the student leaders on your campus, think of this keynote for your next leadership workshop, retreat or conference, and it’s also ideal for Res life, Fraternity and Sorority Life, diversity, and peer education training sessions. James also does a version of this program for professional staff training. Finally, if you are looking for a take-home for your students to continue this conversation, James’ book, Leading Imperfectly: The value of being authentic for leaders, professionals, and human beings, is the perfect supplement. how to recognize the value of sharing their own story as an effective way to inspire learning. Congratulations on your new student leadership position! Being a student leader, however, is an action, not just a title. If you’re a new student leader who wants to take on your new role with gusto or a seasoned leader who wants to leave a meaningful legacy, you will leave James’ keynote with new energy and key concepts to increase retention, boost morale and help your organization do great things on campus that will continue beyond college! James believes “empowerment” has become a flippant term thrown around student organizations, but he will help leaders breathe new life into the act of empowering others by challenging them to do better through a three-part strategy: challenging, motivating and appreciating others. As a student leader in college, James learned some unforgettable lessons that completely affected his life. He admits he took his position for granted and shares some cautionary stories to help students avoid making the same mistakes he made. Leadership, though, can’t and shouldn’t be serious work all the time. With a background in stand-up comedy, James uses the right mix of humor and gravity to make his lessons tangible (i.e., anyone is capable of making mistakes) and memorable. He also likes to present quirky, made-up words to helps students place them into action, like PHEAM (Posture, Handshake, Energy, Attitude will make you Memorable), and valuable networking tips student leaders can use to make a lasting impression on potential members, colleagues and eventually future employers. His unique combination of humor, personal experience, and effective strategies provides a refreshing message for student leaders to do more in their role, and to do it with purpose, confidence and above all, fun. Book James today for your next student leadership event and/or retreat, new officer training and res life programming. the importance of challenging members to give them ownership over the success and/or failure of the group. Stepping on campus as a new student is an emotion-packed time. Am I going to fit in here? Are people going to make fun of my sheets? Is anyone going to date me? How do I study again? Am I the only one who is going to miss my parents? When students are faced with anxiety, they have two options: they can channel that energy towards fear or towards excitement. In this engaging keynote, James will energize first-year students and challenge them to grab their college experience by the horns. There are so many stereotypes out there about “the college experience” and new students are faced with a social pressure from all angles. As a student who was miserable and homesick during his first year of college, James later got involved on campus, fell in love with his school and went on to become a prominent student leader. James shares stories of his freshman year, normalizing many of the emotions first-year students have. He will encourage new students to get involved on campus and challenge them to choose their own path in college. “Don’t choose the path others are taking,” says James. “Leave a legacy.” In typical James-style, he will have first-year students laughing and nodding their heads in agreement. This very personal keynote will challenge students to channel anxious energy toward excitement and to get involved! It’s the perfect option for a new student orientation event. verbal and non-verbal conversation techniques that help build more productive first interactions so that connections can be made more quickly. The past couple years have been illuminating and important years for men. A call has gone out asking men to be better partners, brothers, classmates, co-workers, teammates, fathers, and feminists. For the first time in human history men are uncomfortable, and that is OK; we are a work in progress. In this hysterical and deep keynote James will talk about societal pressures men face and the coping mechanisms typically employed to avoid them. He will create a powerfully reflective space in which attendees will discuss the underlying fears we men have and how they are holding us back from greatness. By the end of the talk, James will have the audience inspired to: hold each other accountable to being more, be understanding and vulnerable with other men, and be better feminists. The vision statement surrounding this conversation is that, men, it is more important to be great than it is to be cool. how to relate the issues above to men’s role, or lack thereof, in the overall treatment of women.